Every year, we make ornaments and sculptures using salt dough. This recipe and multiple variations are all over the web and easy to find so I’m not sure where it originated. This recipe is the main reason I keep iodized salt in the house. It works great and it’s cheap for making crafts. The other use for iodized salt is to clean up spilled egg. Sprinkle it on, let it sit a few minutes and it will gel enough that you can clean it up easily. This dough is soft, smooth and easy to work with. My kids played with it for a long time before they made ornaments. Tomorrow, we will paint them. Sift the cornstarch into a medium to large metal bowl and set aside. In a pot, combine 1 cup of the cold water and the salt. Bring to a boil, remove from the heat and stir with a heavy-duty spoon- not all of the salt will dissolve. Pour over the cornstarch in the metal bowl and stir. Stir in the remaining 1/4 cup cold water and the oil, then knead. 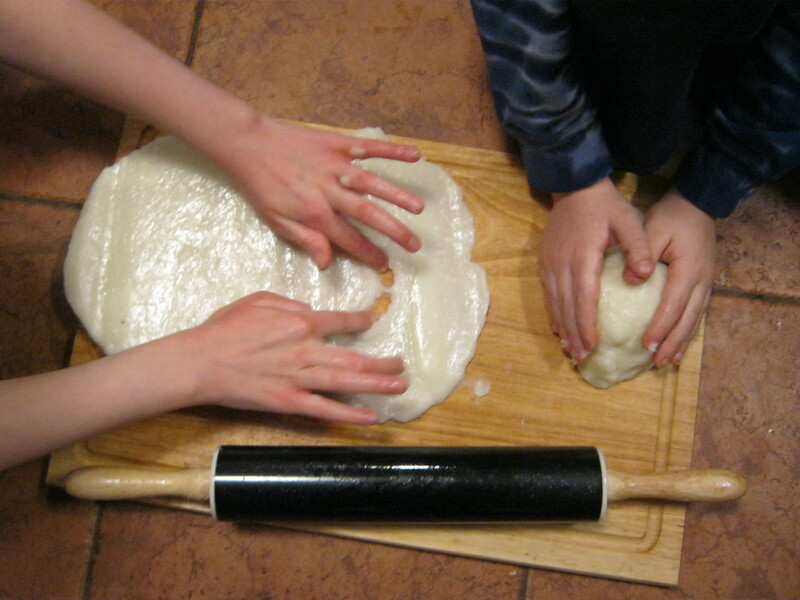 Add water or cornstarch as needed to get the dough smooth. From here, you can sculpt it or roll it out and cut with cookie cutters. In order to smooth it, barely wet your hands. When your kids are done sculpting, set your oven to 200 degrees. Put your items on a silpat or a sheet of parchment paper and bake them until dry. With our ornaments, which were 1/4 inch thick, it took about 7 hours. I turned them half-way through. The sculptures take considerably longer to dry. We do the same thing each year. We prefer to fill our tree with natural and living ornaments over glass and plastic, 4 young kids and glass ornaments are not a good combo. We use a different recipe though and with the oven set at 350 degrees they are ready in an hour.